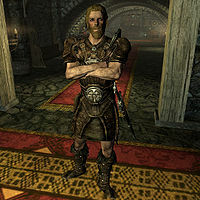 Torvar, a Nord warrior, is the drunken misfit of the Companions of Jorrvaskr. Initially of a friendly disposition, his attitude towards you seems to sour as you rise through the ranks, but he still becomes a potential follower after the Companions questline is completed. It's also possible to marry Torvar once the Harbinger rank is achieved. He wears a simple set of leather armor with matching leather boots. In combat, he relies on a Skyforge steel sword and a steel shield. His only other possession is a spare belted tunic. Perhaps more interested in mead than combat, Torvar will often say to you, "Might head down to the meadery later. See what they're brewing up. You can smell the honey on the wind." After you become Harbinger, he may also greet you with, "Oh, so you're the one in charge now? Fine, fine." You: "Why did you join the Companions?" Torvar: "A man of my station has many debts. I'm not much use at labor or learning, but I can throw a punch with the best of 'em." You: "What does it mean to be a Companion?" Torvar: "It means when I have troubles, I always have someone on my side. We have Shield-Siblings to keep our backs as dangerous as our fronts. I think." Athis: "What kind of weapon do you prefer? I like the smaller, quicker blades." Torvar: "Yes. You're quite fond of saying that. You know I like hammers and axes." Athis: "Aren't they slow? I can get in and out before you can have one swing." Torvar: "Let's test that out sometime." Farkas: "You'll do all right some day. Today you need to keep training, though." Torvar: "Enough with the training. I want to go fight something." Farkas: "No fighting just yet. Not till Skjor says so. We train now." Torvar: "Easy for you to say. You get to fight." Farkas: "But before I fought, I had to train." Torvar: "I've been hunting on my own for years." Farkas: "Fighting people is different. Smarter." Torvar: "Some of them, anyway." Torvar: "One day when you and I are on the Circle, we can change how things are run around here." Athis: "I don't think that's how the Circle works." Torvar: "They're lording it over us all the time, though." Athis: "Young warriors are smart to listen to older ones. They've lived." Kodlak: "My title is Harbinger, child. I am no man's master." Torvar: "Forgive me. You're just the one in charge, and it's what I'm used to." Kodlak: "No one is in charge here. Each Shield-Brother is his own man. Each Shield-Sister her own woman." Torvar: "Well why do I have to listen to Skjor, then?" Kodlak: "Skjor has been a warrior for a long time. You would be wise to listen to him. Any warrior that gets to be old is either fearsome or a coward. I'll let you find out which Skjor is." Torvar: "Do you think I could be a member of the Circle? Some day? If I work hard?" Kodlak: "Don't worry about such things. Just focus on your own honor. Bring glory to the Companions, and that glory will return upon you." Torvar: "I just want to make sure I'm moving up." Kodlak: "This isn't the military, son. There are no ranks." Torvar: "But aren't the Circle in charge? And don't you lead them?" Kodlak: "I guide the Companions. The Circle advises me. But we are all free warriors. Only our honor binds us together." Although his default gear is governed by the Light Armor skill, Torvar is actually more proficient in Heavy Armor. He may attack you on sight after you have liberated Hjaalmarch for the Stormcloaks, even if you are a member of the Companions yourself. After Solitude has been conquered and thus the civil war has ended, he will revert back to his normal behavior. ?